We have hit 1000 likes on Facebook and to celebrate we are offering 20% off our beaded French lace range, 20% off our printed silk satins and 20% off trimmings ! To view some of our trimmings check out our previous blog post. To take advantage of this offer like us on Facebook and simply click 'redeem offer' and present it in store next week. Here are some photos of our beautiful beaded French laces to inspire you ! Get excited and redeem this offer now ! 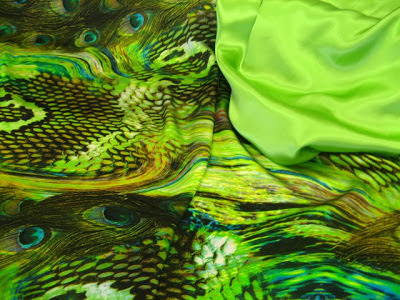 Hello our fabulous fabric followers! I've noticed a lot of blogs use the word 'refashion', where you take a garment whether it be one of your own or from a vintage shop and alter it to bring it back to life. This got us thinking here at SFF, what better way to 'refashion' a garment than by using one of our gorgeous trims to add some bling to a Christmas party outfit. There are so many different ways to use our trims. They could be used as a belt for around your waist or just under your bust, or even as straps. You can cover existing ones or add them to a strapless dress for a completely different look. I have even used a small amount of trim and twisted it around to make an abstract flower to wear almost like a broach. The only thing limiting you is your imagination. Comment below to let us know your thoughts! How have you changed the look of an old garment? P.s don't forget to like us on Facebook as we will be posting photos of our new collection within days! As I mentioned in the rolled hem post, I have been working on a dress for a guest for a wedding. She found her inspiration online and together we fine tuned her design. It was so hard choosing a colour from the 150 shades of silks we have but we decided to go for a pastel shade. The fabric we used for the dress was a dupion silk in the colour 'mint' which I interlined with our shapewell to give it a lovely structure and lined it with our silk lining. The drape is made with our fine silk chiffon in the colour 'duck egg'. The dress is a basic one shoulder shape with panel lines over the bust extending into the waist darts. We put an invisible zip in the centre back. The main feature of the dress is the drape which starts as a ruched strap at the back neckline and extends over the shoulder and curves over the bust. This is then caught at the waist and falls into a beautiful drape that sits just below the hem. Do you realise there is only 8 weeks until Christmas? We didn't! Not only does this mean we need to start thinking about gifts and food, but also what to wear to the upcoming parties and on the big day. Being in Queensland we are usually guaranteed very warm weather over the Christmas period so something cool to wear is on the list. 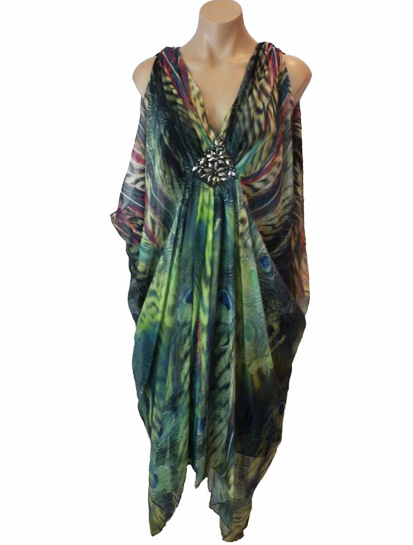 What better to wear than a silk kaftan! You can opt for the shorter length or the full length. 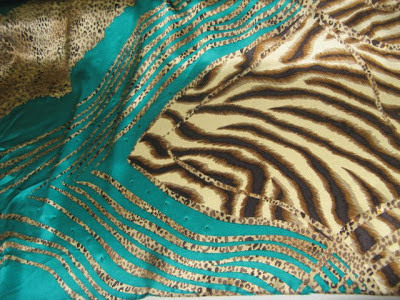 And being a luxurious silk it can take you from day to night depending on the accessories you wear and whether you opt for some beaded trimming. 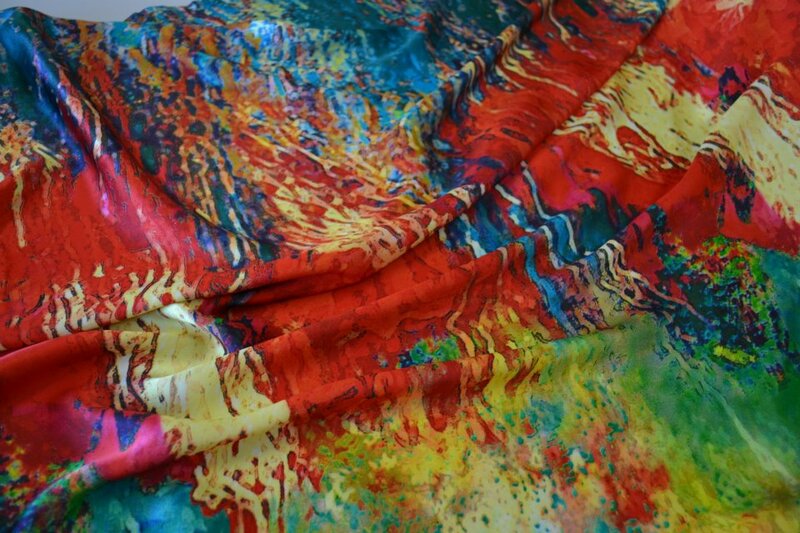 Here at Selective Fine Fabrics we have an amazing range of silks that would be perfect for a kaftan. 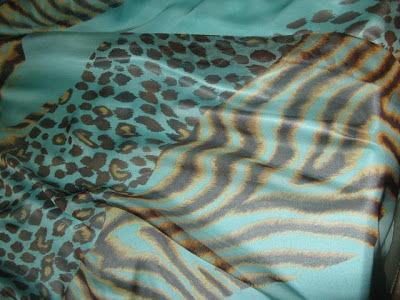 There are plain silk satins or georgettes or we have a huge range of printed silk satins and chiffons. For a finishing touch you could also add one of our beaded trims for around the neckline or a few individual crystals.